This image is the result of a collaboration between mathematician Richard Palais and graphic artist Luc Benard. This image was awarded first place in the illustration category of the National Science Foundation/Science Magazine 2006 Visualization Challenge and was on the cover of the 22 September 2006 issue of Science. 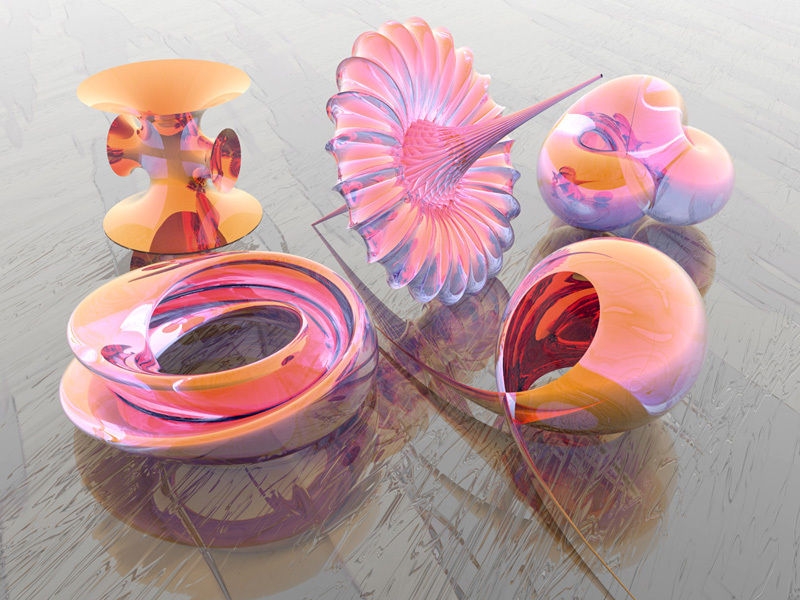 The five mathematical surfaces depicted are (starting from lower-left and moving clockwise): the Klein Bottle, the Symmetric 4-Noid, the Breather Surface, Boy’s Surface and the Sievert-Enneper Surface. The surfaces in the image were created using the 3D-XplorMath program developed by Palais, and assembled and rendered in Bryce by Benard.